“If foreign economies are growing faster than the U.S., shouldn’t we invest in foreign company stocks? And, doesn’t investing abroad also provide effective diversification?” These are questions we’re often asked. International investing – direct buying and selling stocks of foreign domiciled companies – has been an option available to individual investors for decades. Proponents claim superior returns and diversification as primary advantages. 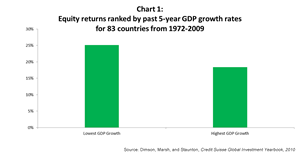 In fact, researchers have found that over longer periods, the notion that higher growth = higher returns doesn’t necessarily add up.3 Chart 1, above (click it for a larger view), looks between 1972 and 2009, a period that both here and abroad captures high growth and low growth periods, boom and bust economic cycles, and bull and bear markets. It’s also a period when trading and advisory fees fell, liquidity rose, and transparency improved. A period, arguably, when the world moved toward greater democratization (of markets leastwise), and the transmission and communication of information across borders vastly improved. In other words, the investment environment was a favorable one for a U.S.-domiciled investor seeking to capture the advantages of international investing. We believe diversification is a critical component of prudent portfolio management, but how one achieves it is just as important. After all, in periods of market stress, if all of your assets move in the same direction, diversification, pursued for its own sake, can destroy value rather than protect it. Advisors and the popular press present international investing as an effective way to enhance returns and diversify risk. Table 1, below, shows the correlation of stock markets around the world for the 10-year period between 1998 – 2007.5 This was a time of meaningful growth in the popularity of international investing concomitant to unprecedented growth in economies like Brazil, Russia, India, China – so-called BRIC countries. The green highlights indicate markets that outperformed the U.S. market during this period. The data shows that for the most part markets moved together during this period (i.e., correlation > 0); it’s the magnitude of movement that varied more. Table 2 below demonstrates this point. Looking at the figures, perhaps it’s easy to see why so many investors were attracted to international investing. The problem with this viewpoint is that correlations and returns are very dynamic; they can and do change meaningfully. The story of international investing since Great Financial Panic of 2008 is much different than the one told before it. Table 3 shows the correlation of stock markets from 2008 to 2012. Note the number of occurrences close to 1.0 (perfect correlation). Since the Panic, markets have moved together, some in virtual lockstep. And, note the green highlights once more as few markets outperformed the U.S. since then. Table 4 shows returns over this period for the U.S.-domiciled investor. If directional market movements are more closely tied together, what accounts for the disparity in market performance? 2008 turned international markets on their heads. The U.S. stock market – one of the most durable, transparent, and time-tested of any across the globe – was down over 30% in that year, but most of the rest of the world was down even more. Deeper wounds often require more time to heal. “If foreign economies are growing faster than the U.S., shouldn’t we invest in foreign company stocks? And, doesn’t investing abroad also provide effective diversification?” Maybe not, we would assert. High growth does not necessarily translate into high return, and dynamic correlations constantly change the relative attractiveness of investing abroad for the U.S.-domiciled investor. For these reasons, we believe constructing a portfolio of high-quality, U.S.-based companies with international reach combined with high-quality bonds that are consistently uncorrelated with stocks provides a more effective means to enhance returns and diversify risk for the U.S.-domiciled investor. We remain focused on understanding current trends in fundamentals because it gives us the best probability of success. And if you’re an active social media user, please consider sharing this topic with your acquaintances. 1 Dimson, Marsh, and Staunton, Credit Suisse Global Investment Yearbook 2010, pg 9. 2 Johnson, Steve, “Rising GDP not always a boon for equities”, Financial Times, 14 April 2013. 3 Dimson, Marsh, and Staunton, Credit Suisse Global Investment Yearbook 2010, pg 17. Ritter, Jay, Economic Growth and Equity Returns, Pacific-Basin Finance Journal, University of Florida, Gainesville, 9 August 2005. 4 Dimson, Marsh, and Staunton, Credit Suisse Global Investment Yearbook 2010, pg 9. 5 A correlation of 1.0 indicates perfect correlation while a correlation of -1.0 indicates perfect negative correlation. Correlations between 0 and 1 suggest market movements in the same direction. Correlations between -1 and 0 suggest market movements in opposite directions.